On Friday, Oct. 5, Atlanta foodies gathered in Tech Square to worship at the altar of The Big Grill. Dozens of Atlanta’s best grill-masters catered in slabs of beef, brisket, pork, chicken for a VIP kickoff event to start the 11th Annual Taste of Atlanta: Grills Gone Wild. Crisp fall weather and a starry sky surrounded the luminous white tent decked out with twinkling lights. Tables laden with some of the most creative concoctions to come off a grill satiated palettes. Libations provided by American Spirit Whiskey and Stella Artois got the crowd just as fired up as the numerous grills. 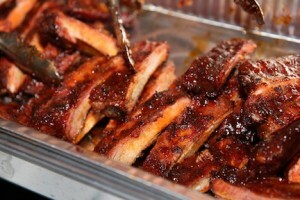 The proceeds from the Big Grill went to benefiting Georgia Organics. Many of the chefs chose to focus on using fresh flavors paying homage to their Southern roots. 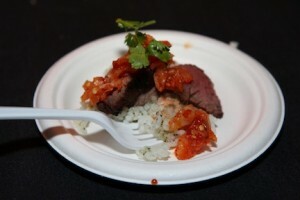 Spring Mountain Farms and Buckhead Beef were both proud sponsors for the event, along with Gas South. Throughout the night, chefs scurried back and forth from the grill pit with more than a dozen big grills to the tasting tables inside the tent. They sure worked their tails off for a good cause! Hangar Steak with scented rice (one of the best steaks ever!) was a very clever combo on behalf of STK. Diners lined up waiting for their steak, hot off the grill then topped with a spicy pepper sauce. 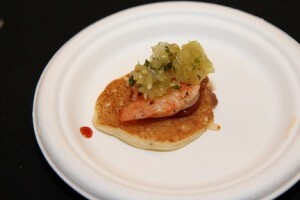 Another popular selection was the shrimp tacos served by famous Atlanta chef Kevin Rathbun. After dining, patrons danced the night away to the tunes of Yacht Rock Schooner and played games courtesy of sponsor Harrah’s Casino. Even the chefs got in on the fun! 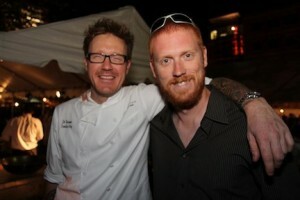 Chef Zeb Stevenson of Livingston, fresh from Yelp’s Ginger Fest the night before at Proof & Provision, took a moment to pose with Pretty Southern’s resident photo guru Kevin Patrick. Big Grill was a hot start to a weekend filled with fabulous food.